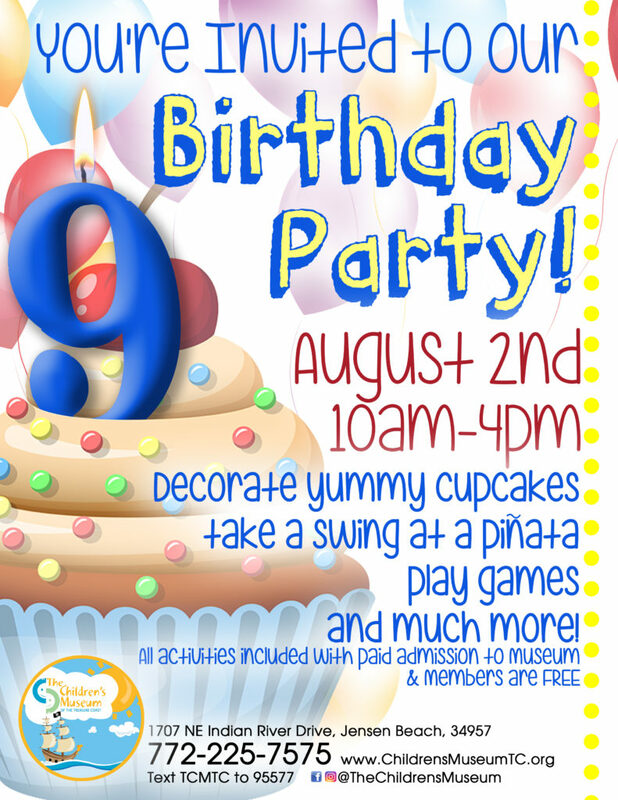 Before heading back to school, join The Children’s Museum of the Treasure Coast as they celebrate their 9th birthday! On Wednesday, August 2nd from 10:00 am – 4:00 pm guests will celebrate by decorating delicious cupcakes and swing at a piñata or two…or three, while enjoying the awesome Children’s Museum. The museum is a great place for children to explore, learn, and play through interactive activities and imagination. The Children’s Museum of the Treasure Coast is located at 1707 NE Indian River Drive in Jensen Beach at the center of Indian Riverside Park. For more information, please call 772-225-7575 or visit www.ChildrensMuseumTC.org.